I am really surprised with what seems to be an overwhelming support of vaccination in the paleo community. Why is this? Anyone who has researched the issue cannot deny there is a very deep debate about vaccines and the health conditions they can trigger. I myself was a healthy person up untill being vaccinated for hepatitis (school requirement) My health degenerated and now I have severe autoimmune thyroid disease and seizures. Vaccine antigens alone are known to increase or trigger autoantibody activity in mammalian models, not to mention highly immuno-irritating adjuncts like thimerisol, MSG and aluminum. IS it worth trying eradicate infectious diseases by bringing out new epidemics of allergies, autoimmune disease and developmental disorders? The CDC estimates that by 2020 22% to 25% of US residents will have at least one autoimmune disease. Best comment I've seen on paleohacks! Haha! What's your point Eva? You're not against vaccines that work - polio vaccine for instance. You seem suspicious on the basis of hindsight, nitpicking the fait accompli, or the past failure, whichever. Here's some useful hindsight. 80% of the Salish - 150,000 people - were wiped out by a variety of diseases, most of which are preventable with vaccination. 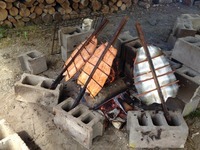 They were as close to paleo as you could want, hunting and gathering a diet which was high in meat and low in carbs. Paleo will not save you from measles and smallpox. I was going to write in my message that I could not find my original source as I found it by accident the first time. However, messages are not allowed to be long enough for me to include all words sometimes. But if you look at the data, it was said that it was not known that simian viruses could get into the vaccine and so it was not controlled or tested for in the early years. SV40 got most of the attention because sv40 is suspected of causing cancer in humans so it was scary. SIV in it's original form is believed to be not dangerous to humans, hence not much attention. SV40 is not SIV is not HIV. I'm an N=1 for a successful hep series. Something unfortunately necessary in these days of dirty needles among people preparing the salad bar. Sorry yours went wrong. Hope it wasn't the fault of the paleo diet. And based on dredging up a stack of anti-vaccination articles we should accept Eva's opinion over big pharma? You've got to do better than that. I'm more worried about the effect of pension assurance bonds on the stability of Illinois as a state than this minutiae. This discussion has more to do with conspiracy paranoia than anything paleo. Serious wool gathering that belongs somewhere else. Correlation and causation....how does vaccination connect with the major causes of American's poor longevity vis a vis the world? We're talking about a hepatitis series that went bad not how evil big pharm is. Introverted paranoia at best, sad to hear about Kresser's daughters being victims of parental delusions, and that GAPS diet compromises health so badly. Did the OP create his own autoimmune response by his diet? I have to wonder, having had a successful hepatitis series while eating the SAD. Luddite nonsense. No one gets to pick and choose good old fashioned vaccines. "Modern things just don't meet the criteria". So stop driving cars and going to the store. Vaccines are peanuts compared to that. This gets us nowhere. What do Adam & Eve have to do with vaccination? Except there's no evidence that vaccines are causing allergies. If a person dies from a deadly peanut allergy, bee allergy (yes beeswax was once used in vaccines) or other allergy or autoimmune disease, the death is not listed as caused by vaccines, so if vaccines are causing allergies, then your death numbers will not be accurate Matt. However, yes, could be a bigger prob if everyone stops getting vaccinated. That's why the govt is probably very scared of any knowledge of vaccines probs getting out. And they should be! If the argument is it may be selfish not to get vaccinated, yes, I agree. Would you risk the health of your child to potentially protect the health of another child? Tough call. What may be better for an individual is likely bad for the society in general. Economics works in a similar way. As an individual, it's better for me to save money but that behavior is really bad for an economy like ours based on spending. What to do? Maybe we should put more effort into making vaccines safer instead of exempting vaccine makers from lawsuits. Uhhh, no. Legit links please or it didn't happen. Although risk of death from either a shot or the deadly disease it vaccinates against is currently quite low, the risk of developing serious allergies due to having undigested peanut, yeast, or egg proteins injected repeatedly into your bloodstream could be much higher. In 2006, vaccine companies got a law passed that exempts them from any lawsuit ever in the US. Paleo eaters often wax on about dangers of undigested proteins passing the gut border but what about if injected directly to blood in presence of immune stimulators? IMO, its a valid concern especially just for flu. Yeah, yeah, yeah… still, you're more likely to die from preventable disease than to die from vaccine, 1000 times more likely. Oh yeah, forgot to add it's an established fact that some humans did get SIV from vaccines grown on simian cells. Live SIV virus made its way into vaccines and was injected into humans and is a close relative of HIV. Theoretically, a slight mutation of one SIV virus could have resulted in HIV but it could never be proved either way as far as I know. They don't know where HIV came from but SIV is the closest known relative. Coincidence? One of the more obvious arguments is that research shows that most vaccines used on pets last just as long as most vaccines used on humans. That means that besides a few exceptions, most vaccines do not need to be repeated yearly in pets. And vaccines DO carry risks to the pet the increase with increased exposure. Over vaccination is a serious issue that should be considered by every pet owner and pet vaccines do not carry the same safety standards as human vaccines. Many of the ingredients are not approved for human use and are not well researched. 30-100 vaccinations to prevent one case of the flu - 1-3%. The majority of folks get flu vaccinations with no issue. The handful of folks who do have some mild reaction... it's still better than the flu itself. I'm more and more convinced the math supports the flu shot. I could imagine, if there were national funding back when bacteria was being discovered, someone proposing that lactobacillus acidophilus causes cancer, because everybody who has cancer seems to have it. Matt, I know what he said. I listened to it long ago- which would be why I knew it was there to link to in the first place. You've simplified the math too much. I'm pointing out the math is a bit more complicated, and it points to the risk being higher than any purported benefit. The shot doesn't fail if you die; the shot fails if you get the flu, if you develop some sort of reaction to the latest adjuvant, if you go through the pain of getting a shot and never get exposed to the strain in the shot, etc. Read all the way through... they talk numbers and they're very similar to what I posted above. Hard to conclude that the risk-benefit balance is tipped to risk, but that's what Kresser and his buddy did. Disappointing since I generally like what Kresser says. Don't like that article? Google it, there's dozens more. But I have a feeling you'll simply dismiss each. I know what Chantix is people. I used it to quit smoking years ago. Just quit cold turkey- that is depressing enough! The point is people were developing a vaccine to do something similar. Even if the vaccine is aimed at nicotine rather than blocking the receptor, it still is pretty dangerous in my opinion. There is a reason nicotine binds to that receptor so well. Chances are you'll have your body binding up things you need as well as nicotine. 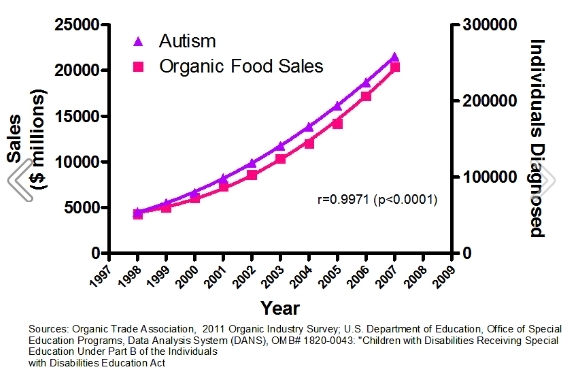 I don't think organic food was caused by autism either. They just say it, they don't prove it. There are correlations and since they've got the white coats they get to say that this particular correlation means causation. I was disappointed when I clicked on that link. I thought, this being paleohacks, you might have found something more persuasive than the average 'red-meat-is-bad' study. It is fine not to vaccinate these children if they are never taken out to playgrounds, shopping, or go to schools with the public at large. A child could infect an infant too young for immunization with a deadly disease. I know of a child who got scarlet fever from an un-imunized playmate who went to a Waldorf school, whose parents were strict Anthroposophists. That child, who was a month away from his scheduled shots, will now have heart problems for his entire life. Not good. August, I was being totally sarcastic with the graph. I absolutely don't think that. Just an example of how correlation =/= causation. Yep, I only got flu shots when they were free and given at work. Matt: I agree with you. I am so annoyed at the continued assertion that there is an Autism link, which as been so disproved, and flies against the research that indicates a genetic cause. What's worse, is that it hinders actual research for a cause/cure. The Bad Astronomy blog has written some very cogent argumants against anti-vaxxers. August: Chantix can cause depression, but it doesn't necessarily do so. Incidences of depression are usually reported coming of it or when mixed with alcohol. And it's a nicotine agonist, not a vaccine. It replaces nicotine in the receptors, the receptors grew because of the use of nicotine. They weren't there before. I have been on it several times with no ill effect. August: Chantix *can* xause depression, but it doesn't necessarily do so. Incidence of depression are usually reported coming of it or when mixed with alcohol. And it's a nocotine agonist, not a vaccine. It replaces nictione in the recptors, the recptors grew because of the use of nicotine. They weren't there before. I have been on it several times with no ill effect. Re: the flu shot… Flu mortality is around 1 in 1000, and like the measles shot, the life-threatening reactions rate is around 1 in 1 million. Always? Did you see the attempt at the anti-smoking 'vaccine'? It supposedly blocks the nicotine receptors in the brain. There are drugs- Chantix- that do the same thing. It causes depression. I stopped taking it as soon as possible. They were going to bring out a vaccine that did the same thing. The receptor is there for a reason, not just for smoking. I think they gave up- I hope. I don't think flu shots make the risk analysis. I think Chris Kressler explains the numbers on one of his podcasts. They are always shooting you up with the last virus, not the one you run into in the real world. Easily explainable by Mommy Bloggers Of Autistic Children. They all go gluten free organic. You have it backwards. Organic food is caused by autism. Much like low carb paleo was caused by obesity. Matt's one of these one-dimensional academic types. He can't help himself. And PI, I would not even continue with Matt. Just friendly advice. You are more than welcome to look up any facts associated with the original question/concerns. If you want to be told them instead of looking yourself, then that is fine. But I don't feel the need to convince anyone of anything. Do as you wish. If you aren't getting the flu shot, which was either less than half effective or barely just above based on the weird results the CDC looks at, then your previous comment just proves hypocrisy. But then again, we all are hypocrites on some level. I won't argue this with you. Make your own decisions. It just isn't helpful to attack people w/ q's. I like the reference to "developmental disorders" too... the autism-vaccine link is so dead and yet anti-vaccine folks refuse to let that go. What science is behind Pi's question? Just a bunch of bad anti-vaccine psuedoscience… Heck, I'm not even pro-vaccine (I'm all for risk-benefit analysis), I don't take the flu vaccine though I ran the numbers on it and I probably *should* take it. From now on, considering my personal experience, as well as reactions I have observed in my vet practice, I will contend with washing my hands, avoiding sick people and maintaining good nutritional status to prevent disease. I like the part where you rationally debated that vaccines cannot induce autoimmunity. Take your anti-science/modern medicine nonsense elsewhere please. Any reasonable risk analysis will show that the benefits of vaccination always outweigh the risk. Life threatening vaccination complications for measles: <1 in 1 million. Measles mortality (developed countries): 1 in 1000. Measles mortality (complicated with malnutrition and lack of medical care): 1 in 10. You're 1000 times more likely to die from contracting measles than dying from the vaccination. Not every concern about vaccine safety is automatically anti-science. The OP seems to raise reasonable questions, not deny any science. Surely, there is a lot of anti-vax misinformation out there. But both sides tend to misrepresent data and distort science to suit their agenda. This relative risk argument also does not take into account that vaccination is routine - every child is vaccinated, up to 50 times in the first few years of life. On the other hand, today, the risk of contracting measles is extremely low (I am not denying that this is due to vaccination). In 2015, there were less than 200 (reported) cases of measles. I would argue that because measles is nearly eradicated, at least for the individual, it is safer not to vaccinate. However, as a public health policy, based on the epidemiological evidence and the current health (or lackthereof) of the U.S. population, I am still inclined to agree that routine vaccination is a rational choice. But while adverse events from vaccines are rare, are we really sure that vaccines do not interfere subtly with autoimmune responses over time? Well, researchers are looking into it. Concerns over vaccine safety can indeed be scientific. You're right, we can't deny that there is a deep debate going on about the safety of vaccines; however, a debate doesn't mean that one side has any validity. There's still a deep debate going on about the accuracy of the theory of evolution, but that doesn't mean that there's any scientific evidence to back up the side touting Adam and Eve and their incestuous offspring. Correlation =/= causation and anecdotes =/= evidence. Personally, I think that autism is caused by eating organic food. See the below scientifical graph thingy. PROOF. Vaccinations have been developed, originally, for children with perfectly healthy immune systems," she says. "GAPS children are NOT fit to be vaccinated with the standard vaccination protocol." "Now we have excellent tests that find chemicals produced by various species of microbes in the gut," she says."??? So by analyzing urine, indirectly we can say what kind of species of microbes are sitting in the gut of the child, or what kind of chemicals they are producing." "...If the child has abnormal gut flora we can assume that the child has a compromised immunity, and these children must not be vaccinated with the standard vaccination protocol because they simply get damaged by it. They should not be vaccinated." Younger siblings of autistic children, and younger siblings of children with all these disabilities should not be vaccinated with the standard vaccination protocol," she warns. So, I think in general, while a vaccine made you sick, it was simply the straw that broke the camels' back. Unfortunately, it doesn't mean that they won't keep requiring them for everyone, even though there is probably anecdoctal evidence that in someone who's sick it could make them worse. I too have had experience with this - i.e. a public health measure that backfired on me, like a flu vaccine making me worse off, and I wouldn't be surprised if the number of these incidences increased over the years. Maybe ask chris kresser about why he didn't vaccinate his daughter? He talks about it in a podcast. Unfortunately, there is no black-and-white issue here - and in taking a medicine for the common good, there will always be someone who reacts and will we know if the reaction is because of poor diet, the vaccine formulation, the child or person in question had an infection already and the vaccine exacerbated it? I am sorry for your condition, but clearly just because many on paleohacks support it doesn't mean it is 100% without risk, like any medicine. I don't think there is overwhelming support, though maybe some of the people trying to make a living in the paleosphere just don't want to touch this subject. My general idea for vaccines- research them. What I think- I think, for me, for things like flu shots and gardasil- risks outweigh the benefits. For the flu, they are always behind the curve, and shooting you up with what they hope you'll get. For gardasil, well, they never really proved a link between HPV and cancer. Their proposed mechanism is 'irritation', if I remember correctly. I would imagine any vaccine would have to be similarly 'irritating' in order to get the immune system to respond. I am sure the funding is much better now, since cancer is so much more interesting than warts. I do hope the little girls shot up with this crap turn out okay in the end. For vaccines for children, well, I don't see giving newborns them immediately. One should wait until the immune system firms up. I can't remember when that happens right now, but if I had a newborn, I'd be looking it up. Then I'd ignore every vaccine that has come out during the era of federal laws that protect vaccine companies from liability. I'd look for older ones with proven track records, ones that protect children from really dangerous illnesses- you, know stuff that tends to end in death rather than the sniffles. Every shot brings with it the potential for complications, so you want the potential benefits to outweigh the potential risks. Most of the modern things just don't meet the criteria for me. I think if we were around when these diseases were killing people we wouldn't even question the chance to take a vacine to prevent it from happening. I think it's important that you focus on bringing up healthy children on a healthy diet so that their immune system can withstand the various things that get thrown at it, be that immunisations or any number of the foreign substances that exist within our environment every day. I have allergies and food intolerances myself but I don't that down to immunisation. I give the responsibility to processes foods, but I may be looking the wrong way.. I will never know. What about the Pharm companys having to pay millions of dollars to women who got the HPV vaccine? That causes cancer in women who have gotten it and that was backed by science. Not saying some don't have benefits but If you might die from cancer why not die from something the vaccine is going against. The point these links show is that there was no removal of any of the simian viruses, not SIV, not SV40, from early polio vaccines. But no one cared much about SIV at the time because natural SIV and many other simian viruses present were not considered dangerous in humans. SV40 got most of the attention because of the cancer. If you really want to know more info, you could easily do a tad of research yourself or even consider the obvious potential implications of info you have already been given. I come here to learn new things and to share info I have found out myself, but if you don't want to seriously consider my info, nor share any new info on your part either, then I see no point to continuing this conversation. There are many legitimate concerns when it comes to vaccines. And while I personally agree that vaccines appear to have done a lot of good, and I don't advocate doing away with them, I do think it's high time to take a better look at what goes into your body when you are vaccinated. The issue is not a simple one. In order for vaccines to actually work, it's not simply a matter of injecting small amounts of weakened virus or virus parts into the blood. That does not work because the body very quickly clears the virus from the blood with minimal effort and minimal immune response. To get a better response, one way is to inject a LOT of the virus into the blood, but that is expensive and cuts way back on profits and big pharma does not take that route. So the other way is to inject toxins or irritants along with the virus, anything that illicits a very strong and prolonged immune response can be used. That is why there are tons of toxins in vaccines. They need to provoke a powerful and long lasting inflammatory response and most babies get about 16 different vaccines in a short number of years. Many of these toxins like mercury and its replacement, aluminum, do cross the blood brain border and cause inflammatory response there as well. Toxic aluminum is in most vaccines in the USA. And when this powerful immune response is generated, antibodies are typically triggered against any and in many cases all protein ingredients in the vaccine. So antibodies are triggered against the virus proteins, yes, that is what is wanted, but also against all other protein ingredients. What other proteins are present? Trace amounts of anything that was used to grow the virus are also present but these trace amounts are not required to be listed on the vaccine ingredients. However, the trace amounts of protein are found when vaccines are tested. What is used to grow vaccine? Egg, yeast, human embryonic tissue, etc. You will find that many are proteins that humans are these days showing strong allergies against. This is not surprising because if you inject undigested proteins directly into the blood stream, immune response is exactly what is predicted, especially in presence of strong immune stimulants, and the response will get stronger with each injection. Also, in the 70s and 80s, peanut oil, which had most but NOT ALL proteins removed, was a very very common ingredient in many vaccines. You were getting undigested peanut protein injected into your veins multiple times, an obviously likely cause of peanut allergy. However, I can't figure out if this is still an ingredient because apparently 'nonactive' ingredients are also not required to be listed in vaccine ingredient lists. However, oil is used in many vaccines and whatever oil is used will contain trace proteins from the source of the oil, be it nut proteins, castor proteins, or whatever. Also, not all ingredients of vaccines are always even FDA approved, like in the case of the forced vaccinations of the military with anthrax vaccine. Another bone of contention is the use of squalene in vaccines. Squalene exists in some parts of the human body naturally and also is used in some vaccines. If the unnatural immune response generated by a vaccine was to result in antibodies against squalene you would then have an autoimmune response to squalene in other parts of your body. Shark squalene, the same stuff used in vaccines, injected into arthritis prone rats, resulted in arthritis in the rats and for some, it was permanent ( http://www.ncbi.nlm.nih.gov/pmc/articles/PMC1850095/ ) Gulf War syndrome vets were found to almost all have squalene antibodies in their blood and those with no syndrome did not have antibodies. ( http://www.ncbi.nlm.nih.gov/pubmed/10640454 ) Vaccines manufacturers claimed there was no squalene in the military anthrax vaccine but sensitive testing by the pentagon found trace amounts of squalene were in fact present in the vaccine. Vaccine manufacturers then claimed the pentagon testers made a mistake. In 2006, the vaccine manufacturers got a law passed that exonerated them from any lawsuits or harm ever done by their vaccines ever. I personally this was done because vaccine makers realized the dangers of their product and were scared themselves. They are now completely safe no matter what happens with any of their vaccines due to negligence or any other cause. Scary! They now have no reason to be careful and even in the case of severe negligence or harm, cannot be sued. IMO, vaccines have done much good but also are likely very dangerous for some of the population that are more sensitive due to genetics and other factors and we need to shine more light and prioritize safety over profits when it comes to vaccinations. But IMO govt is afraid any serious effort to look at problems and safety issues would scare off many parents from getting their kids vaccinated so they would prefer to sweep it under the rug instead. Remember that big pharma is very good at constructing research in ways that yield the answer they want to show the public. They can easily come up with a few studies that show the results they want to show and then just pretend other studies that show the opposite do not exist. So it's not a good idea to blindly trust big pharma. I find it interesting that the vetrinary medical assosiation has steadily reduced the reccomendations for vaccinations of companion animals, because the benefit does not outweigh the risk, (sp. they subject the pet to potential risks of allergic reactions and immune-mediated hemolytic anemia in canines as one example ) yet the number of vaccines reccomended for adults and baby humans continues to increase as the years wear on. America is the most vaccinated country on earth, yet does not have overall better health than other western countries. Although I havent read the article I remember it being brought up that HIV may have been introduced by accident through a polio vaccine manufactured in Africa using chimp organ substrates from wild collected animals. These vaccines were given to over a million people, and it is at least in theory possible that SIV may have mutaed in some of the recipients. Anti-science? I think the question was clearly backed by science. Matt your answer was anti-science. found this website a couple of years ago... but someone might be interested.